Winters are cold in Burgundy, and it is the time when the vineyards go to sleep, to recharge their energy, through the long cold nights, for the growing season ahead. The vines lose the last of their foliage, leaving only bare cane shoots in their canopies. Winter is the time for the old wood to be cut out. We do this with the aim of improving and regulating the growth of the vines once winter is over. The vine in a natural environment is a creeper, which means that, uncontrolled, it would put out a mass of useless branches, which would exhaust its strength, and not produce fruit. The vine has to be domesticated, and pruning is an important way to manage the yield. Pruning at this time of year is hard work, and any idealistic notions about how nice it would be to make wine in Burgundy, can be quickly dispelled by the sight of the winemakers in the cold damp fields in January and February. However it has to be done, and humility, a keen eye, and good judgement, are required for this important vineyard work. The general principles involved are conditioned by the method used, which in turn, depends on grape-variety, soil and climate. Also to take into account, are the number of canes, the age of the vine, planting density, size of previous crops, and damage caused by weather or disease. The usual Côte d’Or system is “taille Guyot”, or replacement cane pruning. Each year two branches are kept. One or more long canes, with up to 15 buds is retained, which will produce this year’s fruiting canes. The second is a spur (“courson”) cut back to two buds from which will grow the following year’s replacement branches. The vines are supported by three strands of wire, one above the other, the middle wire being doubled. 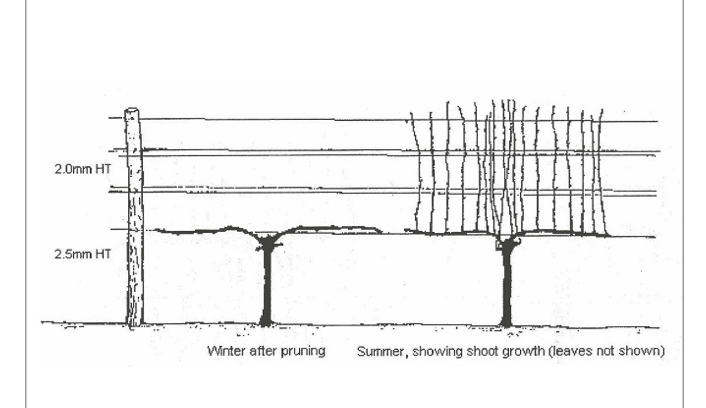 By minimising the amount of permanent wood, the vine’s vigour is restricted, so this system helps to limit yields. 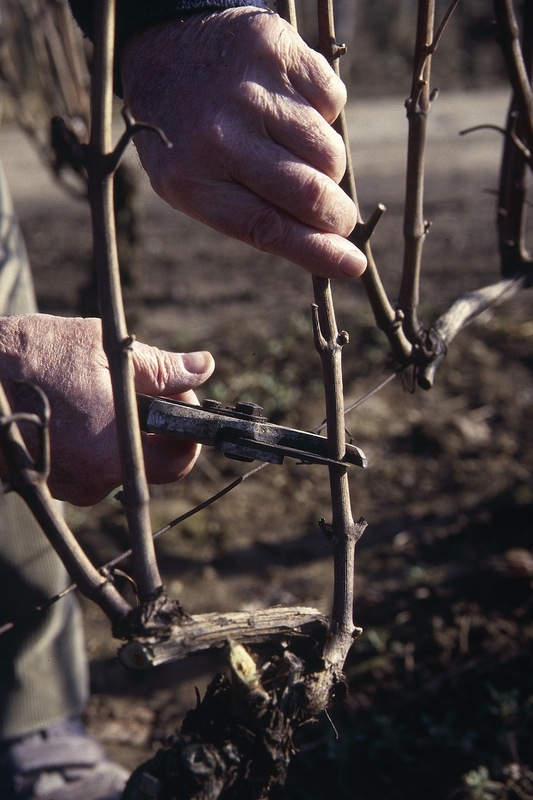 An alternative type of pruning method, is the “Cordon de Royat”, or spur pruning. A larger number of short (2 or 3 bud) spurs are retained. These are usually distributed along a permanent cordon of old wood tied in horizontally to the bottom wire. Vines with a large amount of permanent wood tend to be more vigorous than replacement cane pruned vines. Grapes are different compared to most other fruit, because the grape clusters for this year’s fruit, are formed in the canes in late spring of the previous year. When we prune, we have to keep in mind not just this year, but what was going on last year, and what we want to see the following year. The work of pruning can only be done by hand, and by an experienced vine worker, who can train a vine to something close to perfection. There may be plans to introduce driverless trucks, but machines and computers are never going to replace the human element required in pruning, where judgement is needed based on several years experience in the same vineyard studying each plant. Burgundian tradition has it that pruning should never begin before January 22, the feast-day of Saint Vincent, the patron saint of the vignerons.